PRIYA , CADY N RIYA reached rajath's house a bit early. Priya straight away went to dayijaan. Spent talking to her.
" priya kaisa chal raha hai'"
" ab tak tho tik hai dayijaan pata nahi ab kya hoga"
" kya beta what are u talking"
"priya .. aaj tere liye yek bada surprise hai.."
" bohot bada toofan saamne hai, aur kya surprise baki hai dayijaan"
" beta tujse yek baath karni thi' shadi karlo beti"
" mein nahi kar saktha, mein aaj bhi iss insaan se paayar kartha hu woh meri baccho ki baap hai." " kab tak karthi rahogi tum, how long priya." " jab tak mein zinda hu tab tak i will only love riya's paapa.. payaar ek baar hi hota hai.. mein kisi aur ko accept nahi karsakthi..because am still in love with him" priya has tears in her eyes.she dint even know that ram was there already to greet dayijan stopped hearing the conversion. His eyes moistened too. They all sat in living room and rajath came and sat there ram here is ur surprise .. he pointed to the door ..priya's eyes became blood shot red. Ram turned around and saw he frowned. It was unexpected unintentional, killing his happiness. His jaws dropped. It was Ayesha. Ayesha was stunned seeing priya infront of her eyes, perplexed when rajath called her name " Ayesha ram kapoor' dayijan yeh ram ki patni hai. Ram is missing her and I thought ki it is good we invite her too" "did a nice thing beta. Bahut kubsurath hai.." Ayesha started behaving so well with ram n took blessings of dayijan. Just then riya came there running with a bottle of oil paints running away from cady. She hit Ayesha, Ayesha fell down along with riya and the colour fell on ayesha's saree and on her face, she smugged all over her face giving gaali to riya. Priya and ram rushed there hold riya on either side.
" leave her hand sir" she pulled riya out of ram's grip ,priya cheking if riya is alright.
" am so sorry sir riya ne aap ki biwi ka muh kala kardiya"
" koi pharak nahi padta hai priya"
" kaise aadmi ho tum yar, ur wife is on the floor"
"beta y r u crying"
" uncle aunty ko sorry kehana meri taraf se" she hugged priya tight.. they went off from there.
" cady please change riya to some other dress". priya asked cady .
" so this is ur answer? U want to be in my arms for the rest of ur life"
" ram leave me.. plz leave"
" I know u have feelings for me. I can see it in ur eyes .. come lets seal our relation with a kiss"
she pushed him away. Y the hell ram is behaving like this.
" u know nothing about me ram.. my life is not that u think"
"am alone with everyone around me"
" hmm''.. enough priya am talking about future not the bodged past"
" future.. what future ? with me or my sister! U proposed me and proposal for marriage is for Ayesha. How do u think I trust u? am not sly ram to be ur mistress. What do u think u love me and marry my sister. What the hell u wanted to do ?" she continued her blabbering on and on he pulled her closed to him nailed her to the wall holding her hands firm on her sides. Closed the gap between them trying to cool her anger with a deep passionate long kiss. " priya .. I declare I am married. N u r my wife I sealed our relation with this kiss.if u still doubt me I will take a step ahead in our relation too .i always loved u and will do forever" he moved his hands down her waist, it touched her exposed skin he came down her neck his hot breath tingled her body, when his lips about to touch her skin she gained back and She pushed him away" leave me ram" collapsed in the couch sobbing. He sat beside her placing an arm around her.. "I know u love me a lot, I don't understand where is Ayesha coming from. She is ur sister how could u think ,am I so lame to marry a girl who is 10 yrs younger to me. I love u priya ,maa wants u to be her bahu. Its u who belong with me. No one else" priya moved aside stood wiped her tears. " stop it ram .. what do u know? My mom is thinking that aunty asked for Ayesha in marriage' I don't mind if u marry .after all am nothing n what u have done now has no meaning, just be loyal to whomsoever u marry" she walked away from there..
Ram called his mother and informed to start when he say. He went to priya's college and find her no where. "sruthi' where is priya?" " oh aap ..! u hurted her na.. how long she will bear all this in her life.what right u have to hurt her. I only blame god for writing her fate with wrong people. I was happy all these days at least u are making her happy nut no u proved to join her mother and sister"" sruthi . plz tel me where is she" " is there anything balance to hurt her, ripped her heart to pieces. U have done it already mr. ram" " sruthi I love her .. I only love priya plz believe me. there is a misunderstanding I need to clear it off and stand by my love" " what''.!" Ram explain everything to sruthi. And both sat in canteen sruthi unveiled the secret to ram. "priya is shipra's first born but never been treated as a human in the house still she loves them work hard for them they r allowing priya to stay in the house just because she earns. She is a champ, lady with a golden heart I don't understand y she spare them , if I ask she say just a thing she is my mother n my sister. Who mujhe paayar nahi karthe tho kya hua .. I love them n papa n kartik loves me lot ' hmmm u know ram priya's strength uncle and karthik. Ayesha is so selfish and ungrateful. Karthik is the one darling to priya. She used to work part time for karthik and Ayesha during her college. She stood first in the university in her masters. Her mom dint even cared abt it. Karthik took her to a nearby hang out spot gave her a small treat with his pocket money. Sudhir ji has no voice in his house. Shipra ji invited all society people to in abig party to celebrate u know y .. Ayesha stood a 2nd runner up in a college beauty contest n priya .. became a butler in her house. I asked her many times y her mother is so partial to her . she does know the reason but never let anything out.. ram if u can just give her all the love she deserve." "where can I find her now" " there is only one place she gains herself "
Ram rushed to the place parked the car and walked along .he found her sitting alone on a bench.HE SAT BESIDE HER. " priya . I am sorry " " no ram y r u sorry to me. am happy to be apart of ur life I was so happy to tell u my heart all the night , but my mom wants me to stay away from u. I agree . am not going to come into my sisters fortune" " don't be stupid this is just a misunderstanding I will clear it.. I am telling u that I have no feelings for ur sister. All that is imp for me is u. I love u damn it..i really do , I want a whole life with u.i never felt this for any other women in this world" "stop it ram" " u stop it priya .. I feel to hug u n console ur insecurities I want to make u mine alone " " no ram its not ur fault and mine" " just tell me do u love me" " no .. ram " " look in to my eyes and tell that damn it ""I ' I don't.. no ram please don't force me" " just tell it " "I don't .. [ sobbing terribly fell in her lap] love u so much ram" " I know it" " he pulled her to his arms and hugged her tight. " ram .. I will let happen what fate decide's for me"" I will fight for u . I just need ur support" " am not sure" he sealed her lips again and had a passionate moment moved down her neck making her feel weak in his touch. " ram leave me.. plz' this is our bedroom we r in the beach" " oh wow .. great progress u actually sound like my wife now .. so u do feel am urs .. come baby lets go I have lot to do " " what ' ! don't hold me ,this close to u' I dint say anything to u"" I know ur heart better than u"" uff .. stop it ram.. u sound too cheesy"
Ram informed kk to start at home. By the time ram priya reached kk was in Sharma house. Priya entered kk stood up and hugged priya tight. Shipra eyes narrowed seeing priya nad ram coming together. " papa I have told u abt orphanage walla aunty, aunty papa.." introduced shudir to kk they shared few words. "priya come here" her broad smile fainted as she heard her mom she excused her self . ram was silently observing all the people around his lady love. " priya mein ne kaha tha na .. stay away from this.. it means u stay away from ram" "" maa I dint do any thing ram is my friend n how did it matter if he was about to ask Ayesha in marriage" chup bilkul chup .. u go inside n don't come out" ram over heard all the conversation. He got an idea that shipra is behind all this. Priya went to her room. Ram asked shipra for water. She gave him. They were talking. " priya kaha hai" " ill call her" sudhir said. " if u don't mind can I talk to priya "" no issues beta that's her room" sudhir pointed ram marched. He noticed Ayesha following ram on shipra's signals.he went and locked the door. Priya turned back and saw ram standing and smiling " y did u open my blouse hook.. y r u here"" I just came n saw ur struggling.. ur my wife n I just helped .. " go out I have to change" " may I help u" " plz ram get out of here' its not good if someone see us like this" "oh god .. am here to plan my family" " what.! " " chill I have to talk to u .. go freshnup and come I have to make few calls. Priya went n came . come will go out all r waiting for us. Ram joined with all priya went to kitchen. Served all the snaks. Shipra asked ram if he want to talks to Ayesha he can. Ram said am ok . he disclosed nuts n karthiks love. He announced he wanted to get his sister marry soon after 1month . shipra was too happy thinking that Ayesha and karthik r related to kapoors now. " I am here not only to talk abt nuts but for ur daughter, sir can I have ur daughter to be my wife" "sudhir said haan beta.. confusion still over him " priya stood up and was going to her room Ayesha was so damn happy. " priya where r u going " he went to her made her sit besides kk .. " maa yelo aap ki bahu" " what.!" " ram beta no she is Ayesha [pointing to Ayesha] " " haan I know Ayesha n priya am not lame blind"" kk ji aap Ayesha ke liye rista lekar ayi hu na" " Ayesha keliye.. no .. abhi bacchii hai woh ram se 10 saal choti bhi hai. Hw can I ask for Ayesha, hw do u think so.. I asked for priya" " if that's the thing priya ram se shadi nahi karengi u may go out.. I told u na priya u ll spoil my baby's life" priya ran to her room. " shipra ji we r clear we asked for priya where ayeha came ok then u will soon see what Ram kapoor is n I swear if u try to harm priya I don't knw what I will do' she is mine . agar yeah shadi nahi hongi tho nuts ka bhi nahi honge I will make sure my sister marry a rich guy . I thought i can settle karthik giving him a company of mine n a fashion hub to nuts.. REMEMBER PRIYA IS MINE"
Priya came to senses as she heard cady's voice. Cady and riya went down priya found her dori was loosened. She try to tie it.. she dint notice ram came inside the room and locked it. Ayesha rajath, dayijan, cady n pihu are down in the living. He came near to her and tied her dori.. she felt his space around her after many years. her heart did not allow her to move a bit ram hugged her from back . entwining her hands close to her body pulling her on his body. His lips touched her skin on her shoulder. The warmness passion is still the same. She pushed him away " what the hell r u doing" " priya y r u doing this to me.. and riya" " stop it' don't spell my daughter's name through ur mouth.. what have u done to me? dhoka'." She continued speaking ram pulled her and kissed her. It was love she know him she loves him she dint stop him his passion went on and on till he felt to breath.. he left her to breath. " u dint resist me , it shows u love me. I know u better than any one else.. I was searching for u all these years.. I found u I wil not leave u.. BECAUSE I LOVE U" " BTW u r looking beautiful in this red and black saree.thanku"
Ram left saying the words.. she felt week fell down on bed. Cried her heart out. Washed her face and went to the dressing table. She found a red rose n a white rose.. she knew it it was for her ram might placed it.. when ram arrived cady placed a dvd the song played is " tumse mil kar aisa laga ''''." Rajath asked ram " can I dance with Ayesha.." ram nodded.. rajath took her hand.. priya reached the living the song seems so apt to them ' terimeri meri teri ek jan hai'.' Ram looked at priya.. went to her bend down to riya .. " beta can I dance with ur mom.. mummy ka dance dekh hai aap ne kabi? 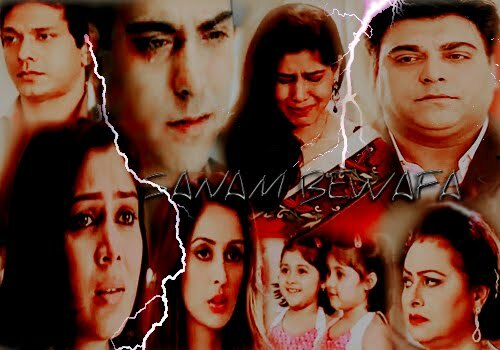 ""s uncle " " help me" " priya'''" ram extended hi s hand and riya took her hand n gave to ram . they danced to the tune.. looking deep to their eyes.. priya's eyes fell on rams lips her gloss is shining on his lips " accha hai" " kya " " tummara gloss ka flavour cherry I think, its sweet." She asked him to clean it " my lips are chapped all these days without the touch of my darlings lips. So let it be" she was lost in him completely that her body responded positively. He brought her close to him ..touching her bare skin on her waist. song came to an end . Ahead to dinner. Ram sat n Ayesha rushed to ram's side.. and priya riya sat in front of him his eyes were fixed on priya. Ayesha felt jealous. " ram ur a lucky man u know y.. priya never danced, but she gave in with u" ram smiled.. " aunty dinner is awesome especially this paneer masala.. its so yum" " haan beta priya ne banaya" " oh really nice" ram said. " cady pass on a aloo paratan paneer masala" "haan aloo parata bhi priya ne hi banaya.."" I like aloo parata so much" " hum ko bhi " riya added to rams words. He thinking[ beti kiska hai] they al finish the dinner' Ayesha showed her attitude. " oh she is ur cook na priya .. right .. yelo tumaara innam . mrs Ayesha ram kapoor ki taraf se. .. " Ayesha .. enough .." ram shouted " aap ko kya ho gaya ram.. she cooked so well so am giving her money that's it.. " " if u don't stop this nonsence I will kill u Ayesha'''" rajath felt bad abt ayesh's giving money to priya. Riya is seeing this ladies rudeness.